I'm in love with this one-pan dish. Roast some sliced fennel and halved new potatoes in your biggest roasting pan. Take them out after 20 minutes, dump your tomato-olive mixture in, set chicken thighs or breasts atop, and baste with a garlicky vinaigrette. It's definitely Autumn, friends. Time to get that oven fired up. "But did you kids like it?" you ask. Ha. My best tips for picky children are here, but I've been thinking about this subject more lately. I have a friend who raised her son on good, homemade, real food. When he got into high school, the cool thing to do was eat fast food. That's what his friends did for lunch, after school, on weekends. It was isolating to bring lunch from home or be the dork suggesting a healthier alternative. He's now a recent grad, at risk for diabetes, and about to be making even more of his own decisions. I've read some research lately that says kids don't just "pick up" on things because of their environment. Modeling doesn't take the place of explicit conversations. So I've been trying to talk with Wyatt about food. As you know, he absolutely loathes heart-to-hearts. He clams up, squirms, rolls his eyes, suddenly has to go to the bathroom. But I press on, saying things like, "It's my job to make sure you eat healthy," "I want you to have the energy to keep having fun," and other odious phrases. I've added this conversation to the ones about being kind, appreciating difference, not being afraid of failure, and other parental pontifications. One of my favorite truisms: "Experience is the thing you get two weeks after you need it." Does that describe parenting or what? Talk about making things up as we go. Poor Wyatt, subjected to provencal chicken and baked goods with nuts. The therapy fund is still there, but I sometimes steal from it to buy sharp cheddar. Serves 4. Adapted from Gourmet, again! I've noticed a new wave of grief over Gourmet's demise lately. Maybe because it's been exactly a year since the news broke and the last issue was published. This recipe is an example of why we're all still sad. The recipe called for breasts and I used thighs, my favorite cut of chicken. Whichever cut you use, I don't recommend subbing boneless, skinless pieces, as you'll miss out on all the delicious drippings that make the dish what it is. Put rack in the middle of the oven, put a roasting pan on rack, and preheat oven to 450. Cut off fennel stalks and discard. Quarter fennel bulbs. Trim cores, leaving enough to leave layers intact, and cut fennel lengthwise into 1/4" thick slices. Toss fennel and potatoes with 2 Tb. olive oil, 1/2 tsp. salt, and 1/4 tsp. pepper in a bowl until well-coated. Spread evenly in hot roasting pan and roast for 20 minutes. Meanwhile, mince four garlic cloves and whisk together with lemon juice, remaining olive oil, 1/2 tsp. salt and 1/4 tsp pepper. Brush chicken with about 2 Tb. olive oil mixture and set aside. Thinly slice remaining 10 garlic cloves lengthwise. Transfer to a bowl and toss with tomatoes, olives, rosemary, and 2 Tb. olive oil mixture. Remove roasting pan from oven, add tomato mixture, and stir to combine. Put chicken skin side up on top of vegetables and roast for 15 minutes. Brush chicken with remaining olive oil mixture. Continue roasting until chicken is just cooked through, about 20 minutes more. 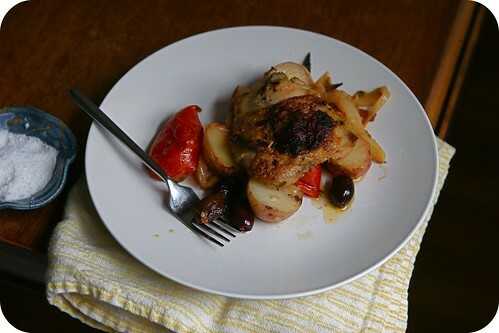 Serve chicken with vegetables, spooning juices over chicken.